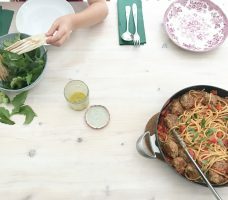 Stop cooking more than one meal a night and learn how to serve one meal for the whole family without drama – even if you’re eating at different times. How to videos where I talk through the plan for the month, share some tips and show you techniques that will help you cook better. The welcome pack and materials for your first month will be sent to you on on the day you sign up. I send these during office hours so if you sign up late in the evening, you’ll receive it the next morning. Then each month after that, you’ll receive an email with your new month’s materials in on the date of the month you signed up (so if you sign up on the 9th you’ll get your materials on the 9th of each month). The first payment will be taken when you sign up. If you’re paying monthly, your monthly payment will come out on the date that you sign up – so if you sign up on 9th January, you’ll pay each month on the 9th. You can cancel your monthly payment at any time by logging onto Paypal and cancelling the payment there. If you’d like to switch to an annual subscription after your first month, you can just pay the difference between what you’ve already paid and the annual amount for the the year. If you don’t want to pay via Paypal just get in touch.